Classic Ryback. 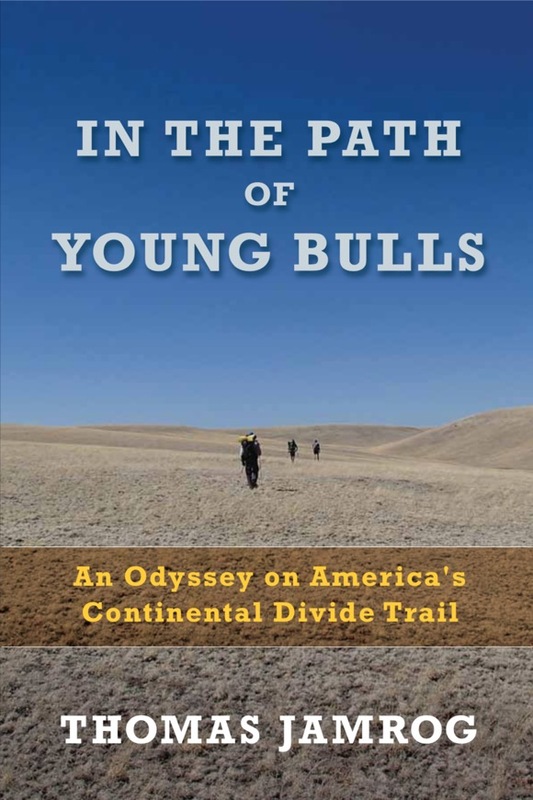 Boy wonder carries 65 pound backpack on the fledgling Continental Divide Trail. Wears blue jeans, heavy boots, external frame pack, freezes beneath a tarp, carries 16 days of food, tolerates serious depression, never mentions anything about town stops, all done in a crisp, fresh writing style way beyond his years. Thanks to my sister-in-law V8 for loaning me this long out-of-print book. Here’s the schedule for the whole weekend: Snow Walker’s. After breakfast, there were three whole-group presentations. I especially enjoyed Laura Beebe’s ” Stories, Songlines, & Ephemeral Mapping in Traditional Inuit Communities. The ability of Native Americans to craft mental maps of their landscapes was astounding. Laura showed us photographs what looked like sticks with carved bumps on them that turned out to be detailed sailing maps. She also showed a photo of an amazingly detailed ” map” that had been made with pebbles and carved lumps of wood that had been placed in a sand tray. The placement and detail were as accurate as a modern satellite map. 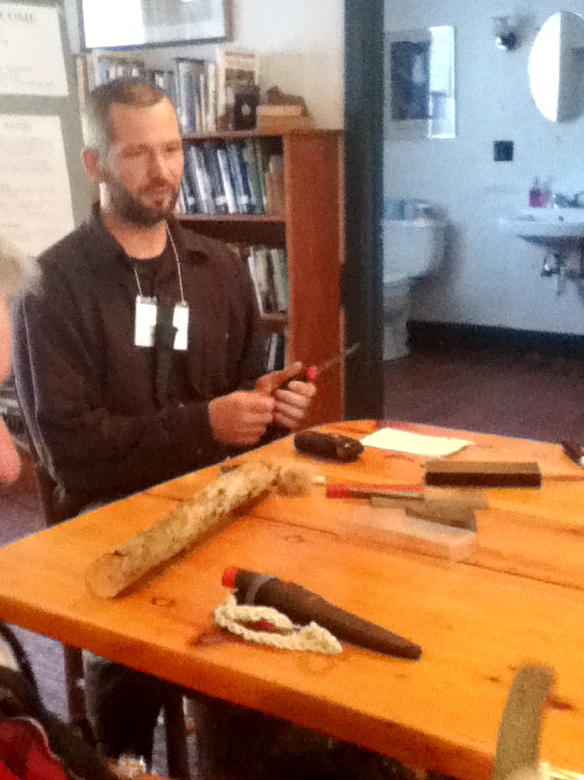 In the afternoon, I attended Mark Kutolowski’s 1 hour- “Basics of Bush Knives” workshop. Mark is a Vermont guide and traditional wilderness teacher. He developed and teaches Physical Education courses in Bushcraft, Survival, Foraging, and Natural History at Dartmouth College. He also leads New Creation Wilderness Programs, a series of retreats focusing on the intersection between contemplative spirituality and wilderness living. 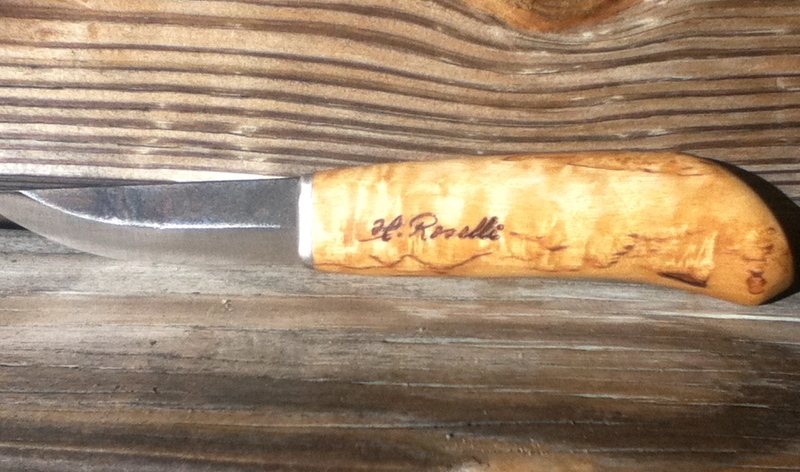 features a beautiful dyed curly birch handle with a 3.75″ razor-sharp polished carbon steel blade. This knife also has a full-tang construction with a brass bolster. Mark’s workshop covered basic aspects of sharpening, as well as carving, including some moves from the wrist, elbow, and shoulder. 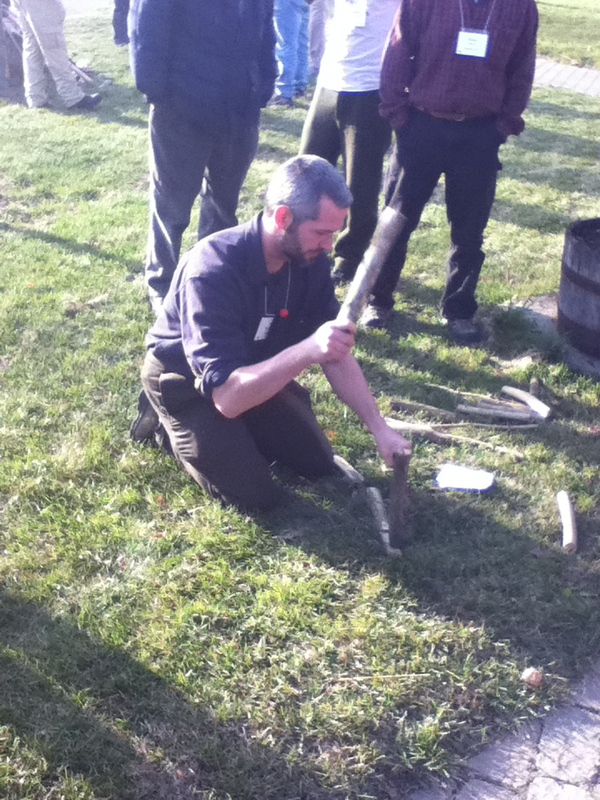 Then we went outside where he taught us how to use a baton to chop and split wood with the knife. Later he demonstrated using just the knife to cut down saplings. I bought a couple of things from some of the vendors as well. One was a pair of angora rabbit wool socks. 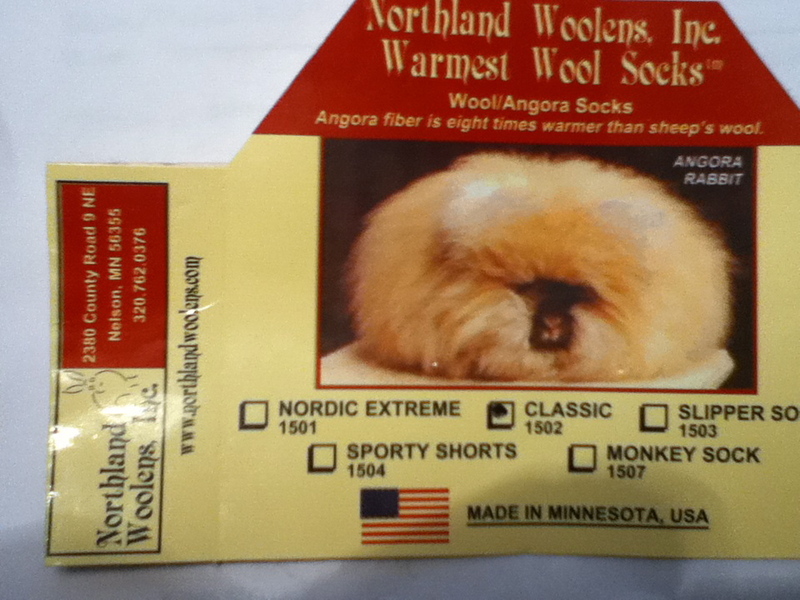 Here’s a photo of the package , with a cool image of the rabbits that supply angora wool. I also bought two books: the latest edition of Garret and Alexander Conover’s Snow Walker’s Companion and a new book entitled Wildbranch: An Anthology of Nature, Environmental, and Place-Based Writing . I plan to review those two items in the coming weeks. By the way, I’d strongly recommend that you ” readers” out there check out the Goodreads web site. I have used it for a few years now and enjoy the ability to organize my reading, store books ” to read” as well as share my reactions and ideas about books automatically with my friends who are also using the web site. You are welcome to view my own Goodreads “shelves”which can be accessed on this page under the Blogroll section to the right of this column. ; the dates for Snow Walker’s Rendezvous for next year- November 11-13, 2011. All at the Hulbert Outdoor center, Lake Morey, Fairlee, Vermont. I’ll be there..
I’s not alone in hoping for the chance to feel deeply around the holidays. As we move about our lives, often without a map or a clue, we encounter doors that we never expected. Today, one of those portals opened for me. You can diss social media, but today my chance came through Facebook, where my legislative representative, Andy O’Brien, posted a YouTube video of a song about Ellis Island, and immigrants coming to live in America at the turn of the last century: The Pogues- “Thousands Are Sailing”. All my grandparents were from Poland, and came here as mere teens, leaving their own families with hopes in their hearts for jobs, love, and homes of their own. It must have been so difficult. I thank them for my life this Thanksgiving. Tonight’s program featured a long reading by Kieran Moore, who was just 20 years old when he found himself living in the Northwest Territories in a Dogrib village of 150 people by the Great Slave Lake in 1970. Kieran told the tale of a three-week long caribou hunting trip. At the time the Dogrib were likely the last nomadic subsistence-hunter Native American tribes in North America. The tale was a compelling story of survival. It took place at a time before snowmobiles, outboard-motored skiffs, and cell phones. The village was running put of food, and the men were pressed to produce meat for the village. Kieran knew next to none of the traveling and survival skills that he’d need if he were to return alive. His writing was masterful, vivid, and of the tradition that brings to the page the depths of life. It is in the same class of book reflecting a similar setting and time, but from turn of the 20th century Labrador rather than the far Northwest Territories: Great Heart, by Rugge and Davidson. 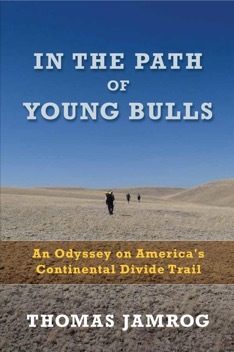 I rate it as one of the top three adventure books I’ve read. One of the features of this event that only improves each year are the door prizes. Here’s the deal- various vendors, and now many of the attendees, donate prizes that are given away during several drawings just before the large group programs. The prizes are placed on a large table in the dining room. In front of each prize are containers. Each participant gets five pieces of paper that you write your name on, which are put in the container corresponding to your choice of prize(s). You can put all five on one prize or put 1 slip toward winning 5 possible items. It’s up to you. This year, there were 52 prizes, more than ever, and with 100 participants, the chances are 1out of 2 that you’d take something home. Of course, several people won two things. I didn’t win anything in the drawing this time, but last year I won a small cast iron fry pan. Auntie Mame scored a big this year: a bundle of four of Sigurd F. Olson’s books. Including The Singing Wilderness. I contributed one prize of three hardcover books about Canadian arctic travel, plus a flashlight. 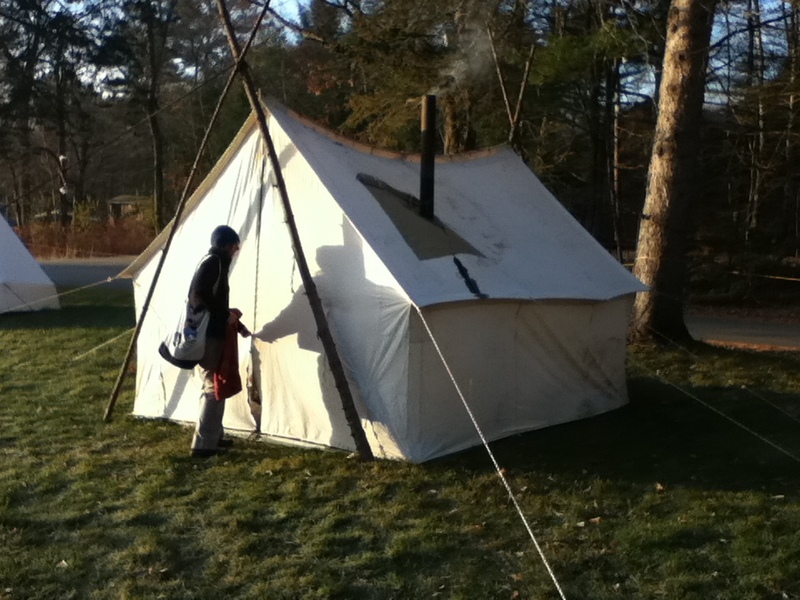 Here’s a shot of one of the tents from this weekend. It’s warm in there! This weekend is one I look forward to, you can see why. Grand day. Heading up to Route 2, the northern road. V8, Auntie Mame, and I will be attending the Snow Walkers’ Rendezvous in Fairlee, VT. It’s the premiere East Coast event kicking off the winter outdoor camping season. It sells out every year, at 100 people. The weather is super this weekend. I have made many friends there and usually hook up with some of them for at least one multiple-day snow travel weekend in the Maine woods. Will be posting from there the next two days. 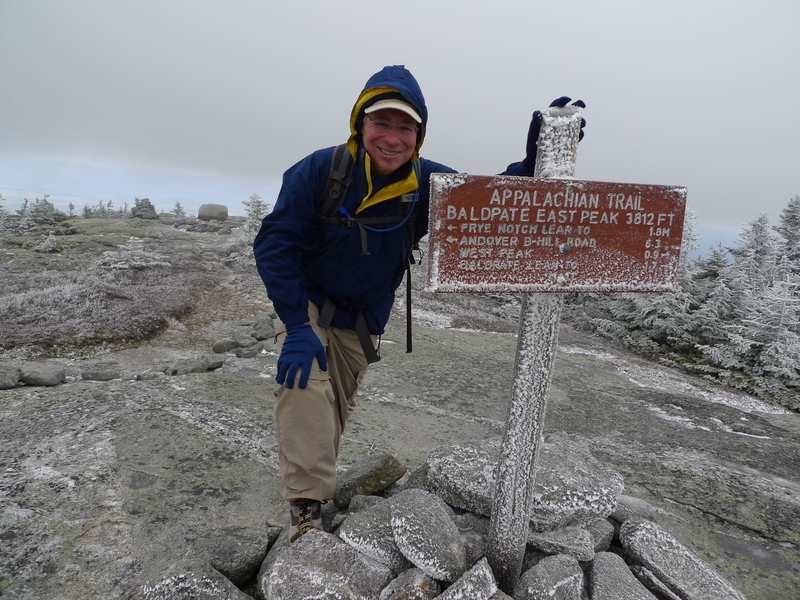 I’m humbled up by hiking the Appalachian Trail in Maine last week. My friend Paul invited me to join him in driving north for about two and a half hours where we the AT intersects at Grafton Notch. This was a day hike. Paul is one of those rare people who don’t mind driving long distances to walk up wet, steep trails. We saw only three other people , walking up Baldpate Mountain on a gray Saturday, in October. Tater’s back in Maine after guiding in Alaska, out of big-time Skagway. I’ve been there, and can tell you there are glaciers in every direction up there. Tater thru-hiked the AT in 2007, the same year as me. I enjoyed talking with him for the mile or so that we climbed up the 3,812-foot mountain together. Tater was set for 21 miles today. Paul and I had just 4 miles north, and then we’d double down. When we stepped out of the car at 9:15 AM, it was lightly snowing. The air was cold, like maybe 40 degree cold, with wind city to boot. Only two other cars in the lot, and a check of the trail register indicated those guys had headed south on the AT, up toward Speck Pond. 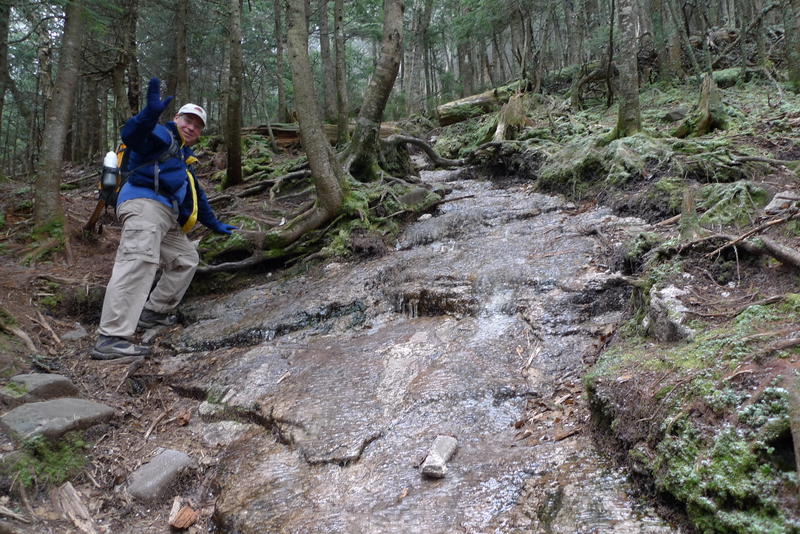 In no time, Paul and I were stepping along the rough footpath characterizing the AT up here in Maine; “wicked” steep, rocky, crisscrossed with slippery bare roots, mud pits, and perilous ice-covered bare logs. When we reached higher elevations, slippery ice flowage came to the front all the way up. eached a sheltered place on the way down. I gulped down a decent chunk of Bubba Craig’s #2 home-made pemmican bar. If there ever was a pemmican-friendly environment that beats this, I don’t know. Life passes along this last month. I hope to return to the trails in Maine when my feet settle down. Meanwhile, I’m riding my bike on the road several times a week, trying to retain some degree of fitness. We’re now in the dark time up here, clocks are turned back. It’s now dark by 4:30 PM. I’m not sure there was anyone in America that was outside more than me these past six months, yet a blood test this week indicated significant vitamin D deficiency. Didn’t Vitamin D achieve fame as the sunshine vitamin?